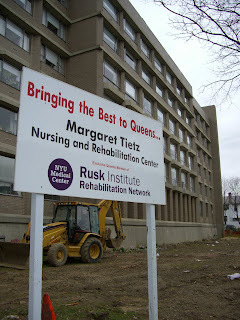 The Margaret Tietz Center has been a fixture of my New York neighborhood since about forever. It sits up smartly on 164th st, and from my point of view, is not architecturally an eyesore to look at. They probably knocked down some pretty nice houses years ago when it was built, but that was long before I ever hung up my hat permanently, in Queens. When I came back from North Africa I could not help but notice that there had been some significant changes going on there in my absence. This sign, with its cheery message, had sprung up probably while I was gazing slack jawed at the pyramids. The first thing that captures my attention is the kindness and consideration that goes with using the words, "Bringing the Best to Queens." They claim to not just be bringing good stuff, but rather categorically speaking, they are bringing the best. Now to be honest, I am not really sure what their best is. What is the pleasing gift they are they about to contribute to my neighborhood, and just how they are going to make it better? What it looks like they are doing, and I am no expert here, is that they have just torn up a nice expanse of once lush green lawn and are going to pave it over and make a parking lot. Maybe they are maybe they aren't. When you see a lot of mud and a back hoe, that is what comes to mind. 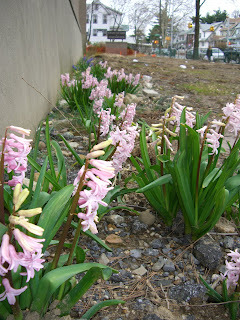 What most folks don't see, I suspect, is that while excavating in front of the building, they somehow did not dig up a nice pretty row of hyacinths. Or at least not yet. 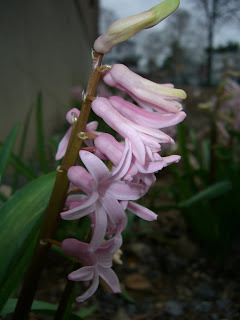 Despite big machines, and stomping men, they are for the most part doing pretty well, as far as fragrant spring flowers go. I thought this little observation goes a fair distance in explaining the purpose of this blog, which is the discovery and enjoyment of beauty in unexpected places and unforeseen ways. And in case you are wondering, the closer I got to this little patch of flowers, the more fragrant and beautiful they became.